"Almost all rivers are dry right now," shared one Gospel for Asia worker, Daniel. But the water shortage in his village in South Asia was just beginning. "The real drought will come in the summer days...We have to wait almost six and a half months for the rain to come." 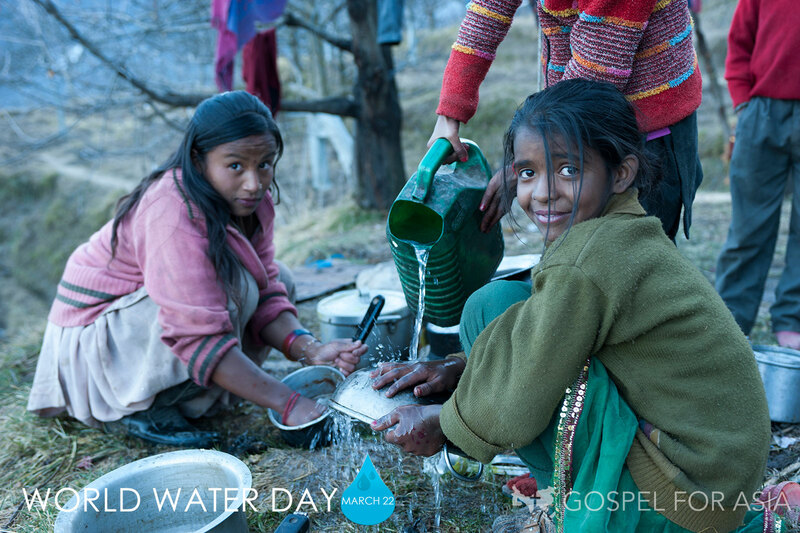 Not far away, Gospel for Asia Pastor Layak spoke of the water shortage his people faced. In the summer especially, the people here would bring water from the other villages," he says. "The nearest village is at least four miles away." Another village also experienced a lack of available clean water. The Gospel for Asia pastor there said, "We store water during the rainy season, and we are still using that. It is not fresh water, and this causes a lot of physical problems, and people get different kinds of diseases. They become sick after drinking that kind of water. But the need in these parched areas run deeper than the physical. Many times, when a pastor comes to a village, the people misunderstand his motivations. Blinded by the notion that the pastor cares solely about increasing the size of his following, many can't see his genuine love for them. They don't understand the depth of his concern for their overall welfare. Today, many of our brothers on the field face similar situations.  While they work tirelessly to minister to the people, many villagers will reject them, not understanding that God's love is not just for eternity, but for the here and now—practical and tangible. Rani Thankur hated Christians—most people in her village did. They refused to pay attention to the local pastor whenever he shared about Christ's love. Rani in particular made a point of insulting the believers when she saw them. But the pastor, Suraj, has a great burden for these people, and he continued to trust the Lord to move in their hearts. The people from this village would walk a long distance to draw water from a well, but the well sometimes ran out of water. When it did, the villages were forced to draw water from a small river nearby. During monsoon season, the river becomes dirty, unhygienic, and foul-smelling. Those who could afford firewood would boil the water to remove impurities, but the water would remain odorous. Those who couldn't afford firewood would drink the water as it was, endure the smell and expose themselves to the pathogens and parasites contaminating the water. Pastor Suraj and the believers began praying for a Jesus Well, and the Lord provided! This pond is where Arnab's family gathered water regularly for cooking. 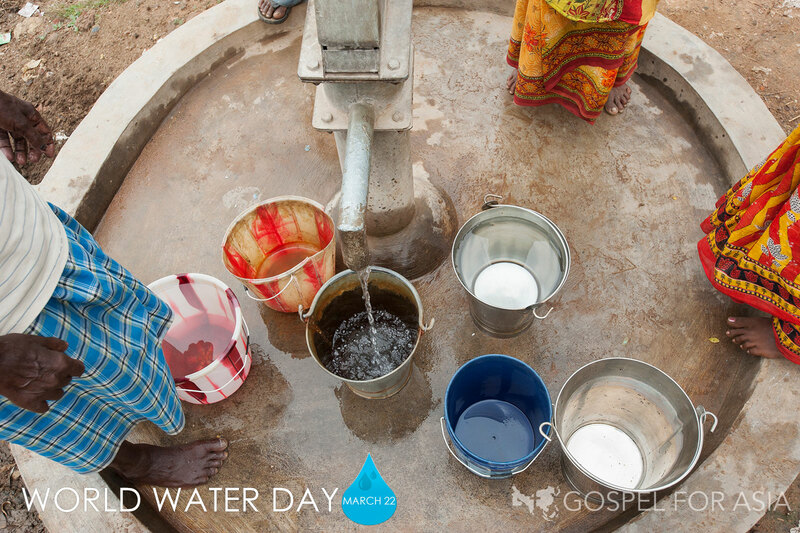 His whole family suffered from diarrhea and other diseases—until a Jesus Well was drilled near his home. 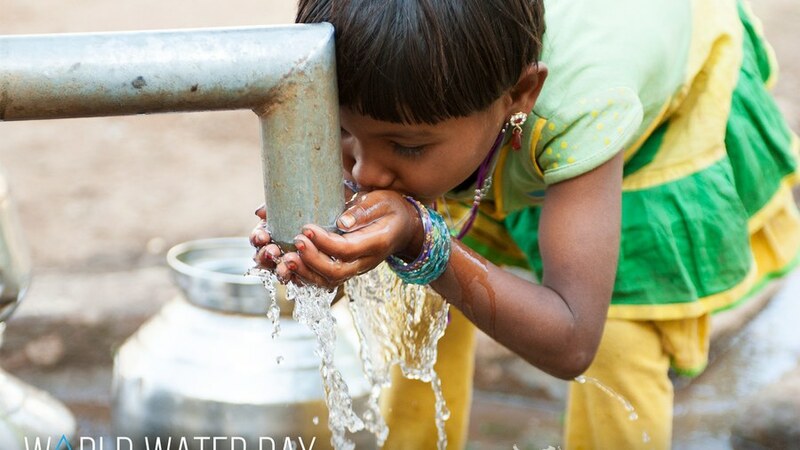 Rani was too ashamed about her attitude toward the believers to draw water. However, one day while Rani was passing by the Jesus Well, Pastor Suraj invited her to draw water, and she sheepishly but gladly did. Later on, Rani asked the pastor how he could possibly worship a "foreign god." Suraj talked with her and shared his testimony of how God changed his life. The Lord worked in her heart, and she eventually recognized God's love for her and responded to Him. Her family reviled the decision. They told her to deny Christ, or else they wouldn't let her live with them anymore. But Rani stood firm. Now that she had come to know Christ, she wouldn't turn back, she told them. She also began sharing her story with others. Rani isn't the only one who has been touched by the kindness and generosity shown through the Jesus Well: Many other villagers have left behind their hostility and are grateful toward Pastor Suraj for providing the Jesus Well. The Lord has used Jesus Wells profoundly. The water is freely offered to all, regardless of their religious background. But his love, demonstrated so clearly through the Jesus Well, makes such an impression on the people's hearts that many choose to follow him. They can understand that this is provided by Jesus—that really, Jesus is the God who considers us. "They can understand that we are doing this for them," shares another pastor whose ministry has been strengthened through a Jesus Well. "After a long time of struggling for water, now they are getting it," he adds. Jesus Wells provides the opportunity to minister to many people. A Jesus Well was drilled in the village Pastor Layak described, where the people once had a negative attitude toward the pastor. "The people are very happy," he shared, "and most of the people are very positive toward our pastor in this village nowadays," says Daniel. 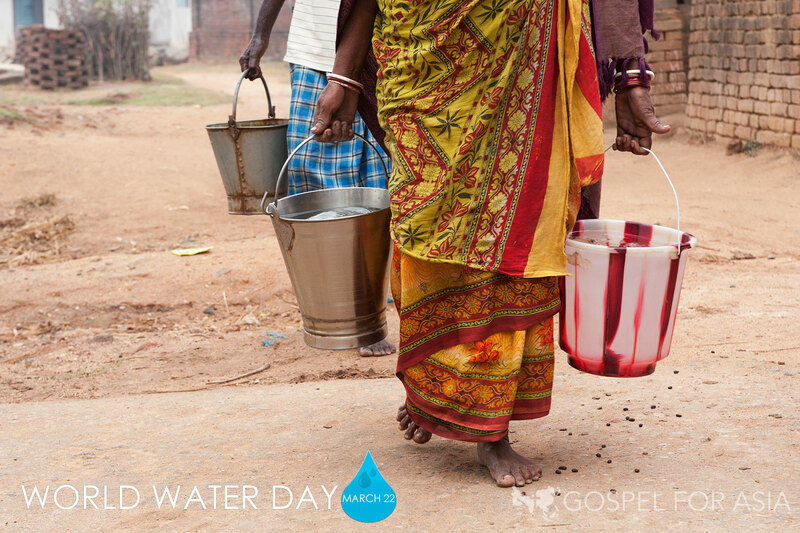 Most water sources in that area provide salty water, but only fresh, sweet water comes out of the Jesus Well. "People are saying, 'This is just because of God's grace. With our God only this has happened,'" reports Pastor Layak. "Jesus answered and said to her: 'Whoever drinks of this water will thirst again, but whoever drinks of the water that I shall give him will never thirst. But the water that I shall give him will become in him a fountain of water springing up into everlasting life." "Before, they did not know about Him—[asking] Who is Jesus?" shares the pastor. "Many people ask regarding this name that we have on that [plaque]...Then they come to know about Him, that He cares for the people's needs and for their lives." 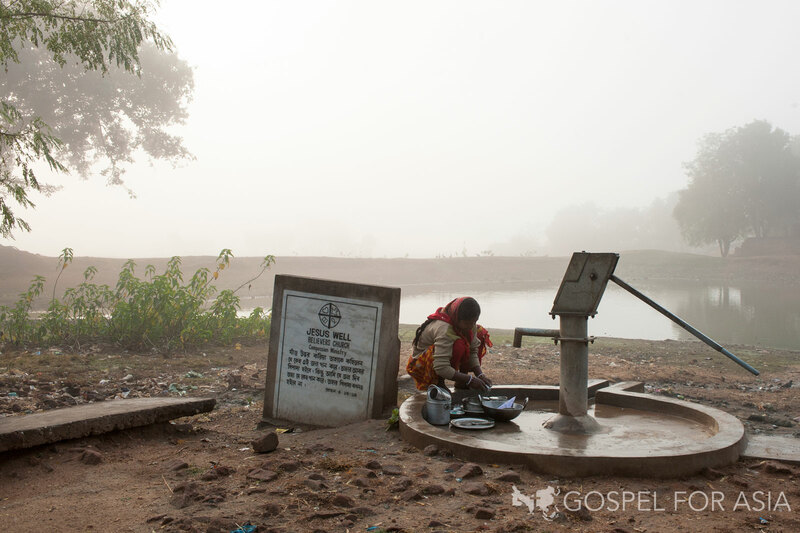 See the story of a village impacted by a Jesus Well. 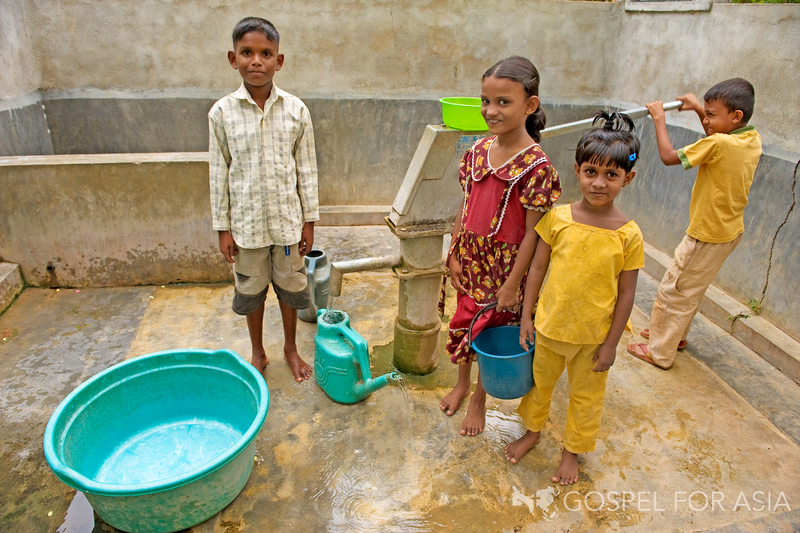 Although other water well projects can cost several times as much, Gospel for Asia is able to drill a well for only $1400. When drilling a well, GFA hires a local contractor. Because that same contractor will be hired to drill a large number of wells, he will give a lower price per well. Additionally, most contractors in South Asia use simple equipment to drill and install wells, so their costs are low from the start. 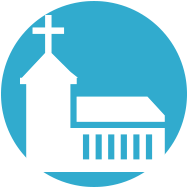 Because each Jesus Well becomes a ministry of the local church, the pastor oversees the maintenance of the well. 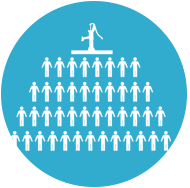 When a Jesus Well is first installed, the congregation commits to maintaining the well. They take responsibility for everything from lubricating the hand pump to replacing small parts to trimming the grass around the well—and sometimes even non-believers help out! When a Jesus Well suffers serious damage from a disaster such as an earthquake or a flood, Gospel for Asia will pay for any needed repairs. 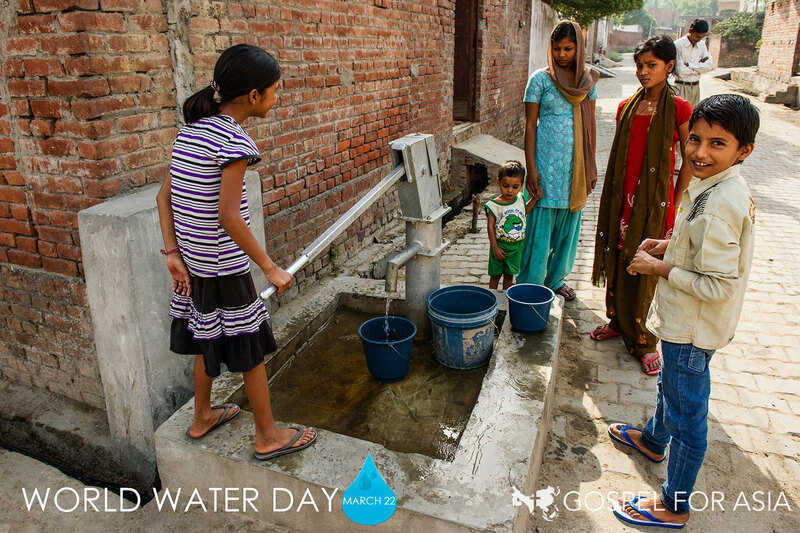 Wells are dug up to 200 meters to ensure water is available year-round, even during the driest summers. 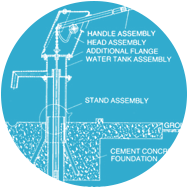 Each well is installed with a heavy-duty handpump. The most common is the India Mark II model. The India Mark II hand pump is a heavy-duty and durable piece of equipment designed through joint efforts of several world service organizations. Although its rubber seals will need to be replaced about every four years, the pump is intended to operate 20 million cycles before requiring mechanical repair. This translates into a lifespan of approximately 20 years with eight hours of use daily. The pump’s simplicity makes it easy to fix. Standard specifications allow replacement parts to be easily obtained at a minimal cost. I extend my heartfelt thanks and greetings to those who supported and prayed for this Jesus Well! On behalf of all my church members and from these villagers and especially my family and me...thank you so much for helping us to survive and for helping us to [share God's love] in this place.